The connection between the footing and an ICF wall is very important. Too often, this connection is omitted from the discussion about reinforcing an ICF wall. There are a number of factors that have to be taken into account. These include the wind loads, exposure categories and seismic zones. The typical connections between the footing and the ICF wall are either a keyway or dowels. Keyways are made by setting a 2×4 into the top of the footing when it is being poured, and floating the concrete flush with the top of the board. When this is removed, it leaves a shallow trench for the concrete from the wall to fill into, and will prevent the wall from sliding transverse across the top of the footing. Dowels are lengths of rebar that extend from near the bottom of the footing up into the cavity area of the forms, and are used to control a transverse sliding movement, as well as pulling or tipping movement. A good ICF footing will be at least 11” deep, allowing for 8” of the dowel to be embedded into the concrete (a 4 to 6-inch “L” at the bottom further strengthens this connection). The Prescriptive Method recommends that the dowel then should extend at least 8” from the top of the footing into the ICF wall. The minimum spacing for these is 4’o.c. BuildBlock always recommends 40 bar diameters extending from the top of the footing. In areas listed with 130 mph+ for 3 second gusts or seismic zones the spacing of these dowels should be tightened to no more than 18”o.c. 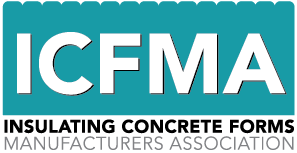 The length of the embedment into the ICF wall should also be increased to 20” – 24” for #4 or #5 rebar, and align these with the vertical steel. In seismic zones it is further recommended to put a 90-degree bend, 6” long at the top of the wall as well. 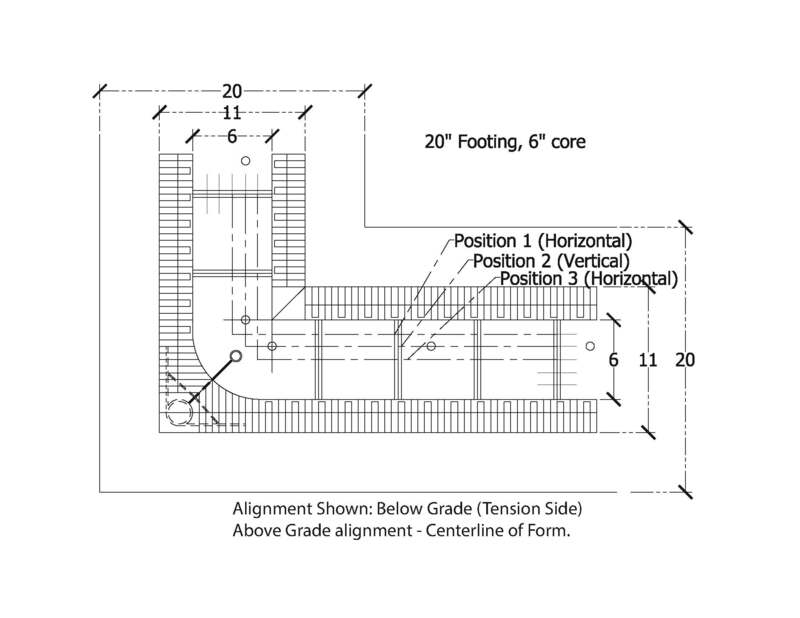 It is permitted to insert the vertical steel so that it is embedded into the footing by 8” as an alternative to dowels. This is best accomplished with a monopour or at least wet-set installation, or when using knockdown forms. Other than the monopour, this method will generally increase the block stacking time; the dowel method is preferred. Lintels around doors and windows should also be installed with the vertical rebar on each side of the opening having a corresponding dowel from the footing, and should maintain the minimum 40 bar diameter splice length. This will ensure that the lintel is reinforced properly. Lintels over 2 feet in width must use rebar extending 24” into the wall horizontally each side. Saferooms should have dowels placed to match the vertical steel, on 12” centers, and extending into the wall cavity 24”. This is especially important as the loads that the safe room is designed to handle require a deeper foundation and larger footings to prevent the walls from being compromised during a storm. It is also recommended to use an “L” on the bottom of the dowel in the footing, pushed to the bottom of the footing and lifted 3”. It is important to note, that while the interior slab will prevent the wall being pushed inwards by backfill dirt, it doesn’t control any movement toward the outside of the footing. The backfill, properly graded and compacted, will retain the walls, but having a keyway or dowels in place will eliminate any chances of movement before the backfill is in place. 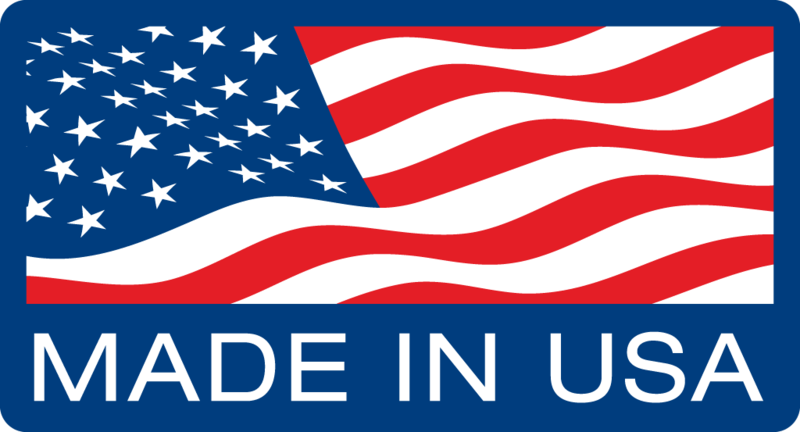 upscale construction, and thereby provide additional strength and protection. Note: Rebar Placement as shown in the diagram, alternating the horizontal bars either side of the vertical bars allows for a simplified installation of the vertical bars after the walls are stacked. The horizontal bars effectively capture the vertical bars, and prevent them from moving outside of the parameters of a non contact lap splice. 1. For center of block pins, the measurement is 11-1/2” from outer edge of footing or 8-1/2” from edge of block or wall. 2. For the two corner pins, the measurement is 14-1/2” one direction and 11-1/2” the other direction for each pin. 3. For the corner web steel, the measurement is 11-3/4” both ways. For other size block, adjust measurements accordingly. ). This example uses 6” BuildBlock/BuildLock forms. Adjust as necessary for larger or smaller forms. 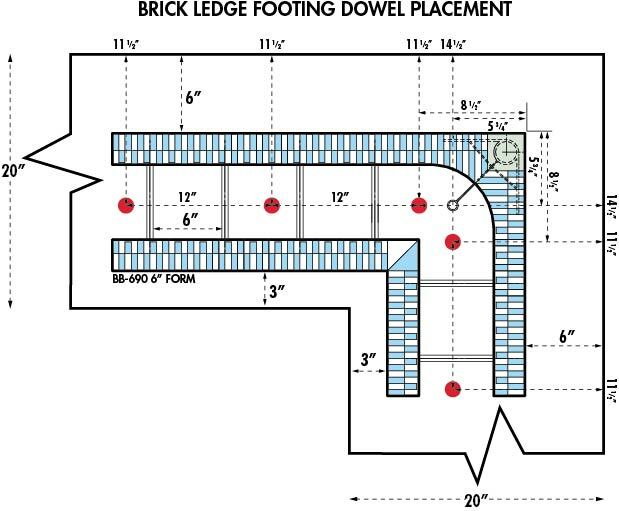 Placement of forms on footing may vary based on exterior wall finish. Do not place rebar in the corner web until after the wall is stacked. Refer to Section 4.2 for Rebar Dowel Depth. 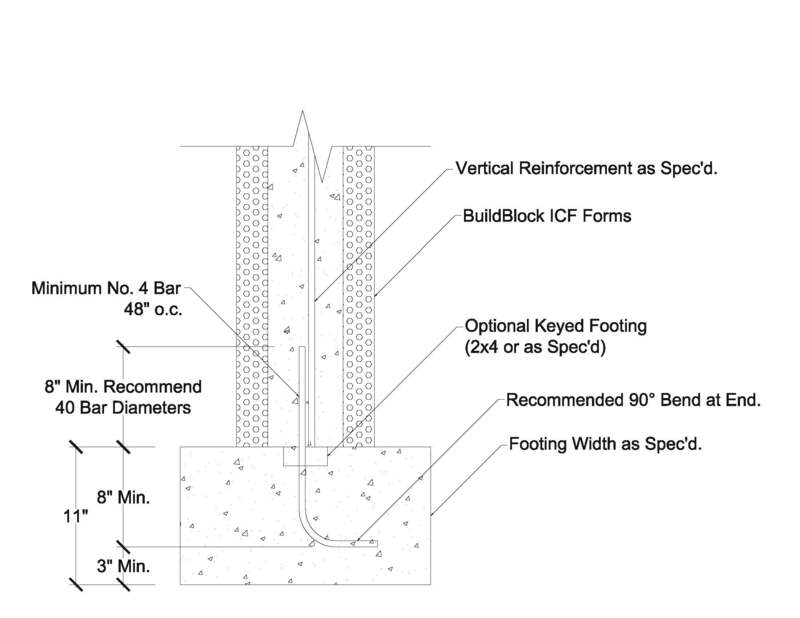 The graphic below illustrates the minimum specification for a footing to ICF wall connection, per The Prescriptive Method. BuildBlock recommends using a hook (either a 90° bend, or a 180° hook) to add to the retention within the footing. BuildBlock further recommends that the dowel extend from the footing by 40 bar diameters to create a full splice connection to the vertical steel.